Our core product, silica glass, features superior properties in the areas of translucency, ultraviolet light permeability, thermal resistance, chemical resistance and thermal shock resistance. Our silica glass is used mainly in scientific equipment, as material for semiconductor manufacturing, and in optical equipment. However, silica glass is known as a difficult material for high precision microfabrication due to its superb chemical resistant and thermal resistant properties and its brittle mechanical properties which cause it to crack easily. We have developed silica glass microfabrication technology through the hot-pressing process to provide our customers with silica glass that is reasonably priced and that can be used in a variety of different fields. 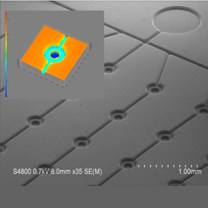 Currently we are developing silica microfabrication substrates using this technology. Allows batch processing to be performed on complex shapes (see Figure 1). Can handle shapes, including stepped shapes, that can be fabricated into dies. Can be sealed via a fused-silica cap and can laminate substrates (see Figure 2). When sealing, electrodes and silica optical fiber can be implanted simultaneously. Can contain different materials that exhibit properties of thermal resistance. We are continuously aiming for ever larger pressable area, faster fabrication speeds, and better fabrication accuracy. 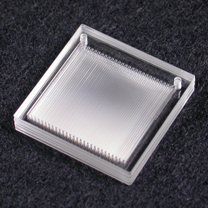 Silica microfabrication substrates are intended for the µ-TAS market which is forecast to grow and is being developed in the medical and bioscience fields, and in micro channels for micro reactors. We are also considering applications for micro-optical cells used in analysis, micro-optical devices, small-scale heaters, and various sensors. We are researching technical applications in each of these areas. An amorphous form of silicon dioxide. It has higher heat resistance than conventional glass, between 1,000°C to 1,200°C, and high-purity forms such as synthetic silica glass, etc. feature superb transmittance of visible light and ultraviolet light. However, silica glass exhibits absorption of infrared light. Silica glass reacts very little to acids other than fluorinated acids, but responds to some degree to alkali. It has an extremely low thermal expansion coefficient of 5.6×10-7/°C which gives it superb thermal shock resistance properties. A system or concept that is meant to efficiently chemically process substances in a microscopic space and to perform high-speed high-precision analysis of minute amounts of specimen material. It is anticipated that ultimately the µ-TAS will consolidate all operations, sampling, pre-processing, measurement, and analysis, into one chip substrate resulting in the achievement of Point of Care (POC) systems. A reactor that is characterized by its ability to efficiently chemically process substances in a microscopic space. Because micro reactors have a large surface area in relation to their volume it is anticipated that they will reduce diffusion length, improve temperature tracking, and increase reaction area sizes. Micro reactors create reaction products intended for higher yields than previously possible and offer the advantage of being able to safely perform even dangerous explosive reactions. However, enabling them to handle mass production is one challenge facing the development of micro reactors.